Leawo Music Recorder for Mac (http://www.leawo.org/music-recorder-mac/) is the best music recording software for Mac OS X. As a professional music recorder for Mac, it could act as a streaming audio recorder for Mac to record Mic or other built-in input audio stream, and also record computer audio stream or online music just like an online audio recorder for Mac. Alongside the function of recording audio on Mac, this audio recorder software for Mac OS X also features multiple functions to improve music amusement, including: effectively manage recorded audio library, complete recorded music information from online database for free, automatically cut different songs during recording, support manual edition to complete recorded music info, play recorded audio files, etc. Moreover, Leawo Music Recorder for Mac allows you to set recording start time and recording duration, add recorded audio files to iTunes in one click. 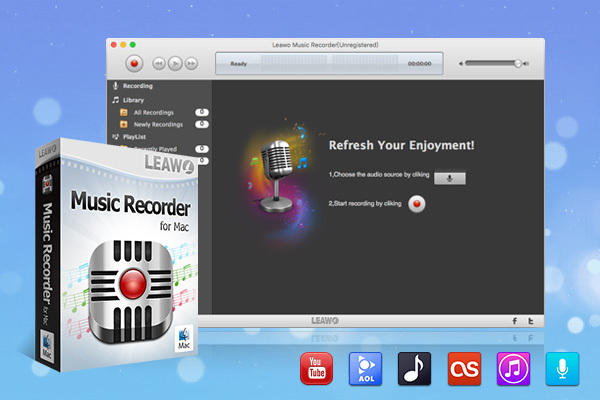 Key features of Leawo Music Recorder for Mac 1. Record Mic or other built-in input audio streams. 2. Record computer audio stream or online music. 3. Record all sound to MP3 files for various players. 4. Support to set recording start time and recording duration. 5. Automatically add music title, cover, album, artist, etc. 6. Split recording automatically between different songs upon recording time gap. 7. Automatically filter recorded files upon preset recording duration. 8. Support one-click operation to add recorded audios to iTunes. 9. Display all recordings and newly recorded audios. 10. Display details of recorded music files: name, time, artist, album, genre, date, etc. 11. Support to search files upon key words of manual editing. 12. Support to play and preview recorded music files. 13. Show detailed music files and quantities in playlist. 14. Support to edit, add and delete customized playlist 15. Support to edit music tags: cover, title, artist, album, year, genre. ImElfin Video Converter for Mac is the ideal video converting software for Mac users to convert amongst a vast range of standard-definition video formats and HD video formats with splendid quality and super fast speed. iFunia Photo Slideshow for Mac is the digital slideshow builder that allows you to flow you picture collections freely into a slideshow and to mix them with music to impress your audience. Completly Free AAC to MP3 converter. Do you want to convert AAC to MP3? With our simple tool you can do it in a mattter of seconds and best of all its completly free.Thats right no trials and no limitations! Start converting FLV files into WMVs with the Easy FLV to WMV Converter. It's fast, free and easy to use. Available for both Windows and Mac. WinX DVD Ripper to iPhone is the fastest iPhone ripper which is able to rip DVD/DVD ISO image to iPhone 5S/5C/4S, iPod, iPad Air/mini retina,Apple TV, It is double speed than other rippers. This site does not contain serial number, crack, keygen Leawo Music Recorder for Mac serial number : serial number is the simplest type of crack. A serial number(cdkey,product key,etc) is register the program as you may already know. a crack or keygen may contain harmful software. If you cannot find the exact version you want, just give it a try. for more information read .nfo/.txt/.diz file include in zipped file.